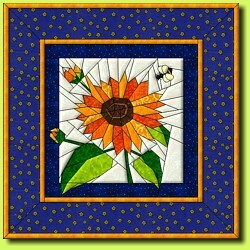 This pattern was published in the September 2005 edition of the US magazine "Quilts with Style". You can request a copy of the magazine at equiltpatterns.com. Organza ravels a lot and is very slippery. Both challenges can be overcome. Make freezer paper templates (without seam allowances) and iron them onto the right side of the organza. Yes, this works as long as the iron is not too hot, but just warm enough to melt the wax of the freezer paper. Experiment on a remnant. 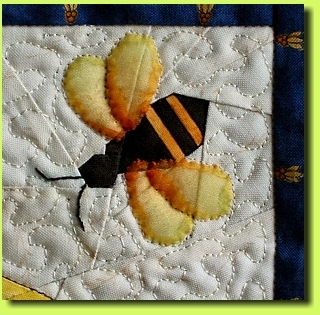 Cut out the wings with generous seam allowances. Make yourself comfortable and light a candle. 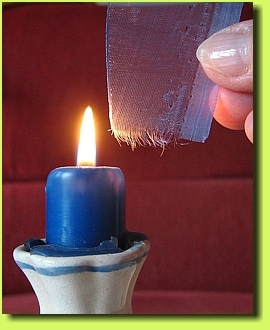 Now slowly move the edge of the organza wings towards the flame of the candle, until you see that the fibers start to melt. 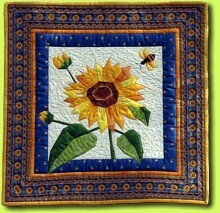 This process fuses the fibers and prevents their raveling. Move the entire edge of the wing along the flame. It will shrink a bit, but that's why you added the extra seam allowance. Having secured the wings' edges and stabilized them with freezer paper they can now reasonably well be appliquéd using the needle-turn method.